A new species of silverfish has been found in the UK – is this an explanation for treatment difficulties, due to misidentification? A 2016 entomological publication highlights the emergence of the grey silverfish as a pest new to the UK This new species Ctenolepisma longicaudata was reported for the first time in the UK, from a domestic property in Whitley Wood, Reading, Berkshire. Previously, there were only two similar species in the UK, the common silverfish Lepisma saccharina and the firebrat Thermobia domestica. This finding takes the number up to three, with the addition of the grey silverfish C. longicaudata. On 7th December 2014, the first author of the paper (Goddard) discovered a rather large silverfish in her kitchen. It soon became apparent that this was not the common silverfish Lepisma saccharina, as the sample was quite hairy, with a longer body length [11mm] and long antennae and bristles at the rear. The specimen was just under 40mm in length from the tip of the antennae all the way to the tip of the central ‘hair’ projecting from the end of the abdomen. This is much longer than the common silverfish and its grey appearance also ruled out the firebrat. Following the discovery of the first grey silverfish specimen, a number of other individuals were found in the same building up to 21 December 2014. Behavioural observations were made that backed up the literature references to C. longicaudata feeding on starchy materials, as all the grey silverfish individuals were seen to be attracted to breakfast cereals spilt on the kitchen floor. What about the rest of Europe? Through trade, C. longicaudata is considered cosmopolitan in its distribution, as are the two other similar British species, the common silverfish and the firebrat. The grey silverfish has been recorded recently in Belgium and the Netherlands (Shoelitz and Brooks, 2014), as well as Germany and is thought to be under-recorded. Another interesting point about this species is that anecdotal evidence suggests C. longicaudata has been noted in the UK before but not confirmed reliably and can be associated with imported food products (Goddard et al., 2016). So it could have been around for longer than we realise. As previously described, the first record of Ctenolepisma longicaudata in the UK was from 2014 and published in 2016 (Goddard et al. 2016). The record was from a domestic property, but these are not the only places in the UK that have become home to grey silverfish. Following on from the domestic record, David Pinniger and colleagues have reported a quantity of silverfish identified as Ctenolepisma longicaudata, located on insect monitors in the Museum of London’s costume store in 2015-2016. Elevated numbers of specimens were typically collected at the lower level of the basement level store, underneath a section of roller racking tracking. While packing materials such as acid-free tissue were damaged by grey silverfish grazing, no collection items were seen to be affected. The grey silverfish activity is being dealt with by the use of desiccant dust. Crucially, C. longicaudata appears to survive and cause damage at lower humidities than L. saccharina and so the potential threat should be considered serious. Importantly, management of environmental and storage conditions by reducing humidity, which is the typical way of silverfish control, may not provide the same results when dealing with the grey silverfish. Based on this knowledge, the roller racking tracking in the Museum of London is being ventilated to lower humidity locally, but this is being done in conjunction with the aforementioned application of desiccant dust. The quantity of insect monitors has also been increased in the storage area, to gain more information on the population and distribution of grey silverfish. This example represents the first recorded established activity of grey silverfish from a UK museum. Further activity has recently been reported from catches on insect monitors in a London Art Gallery in summer 2016. 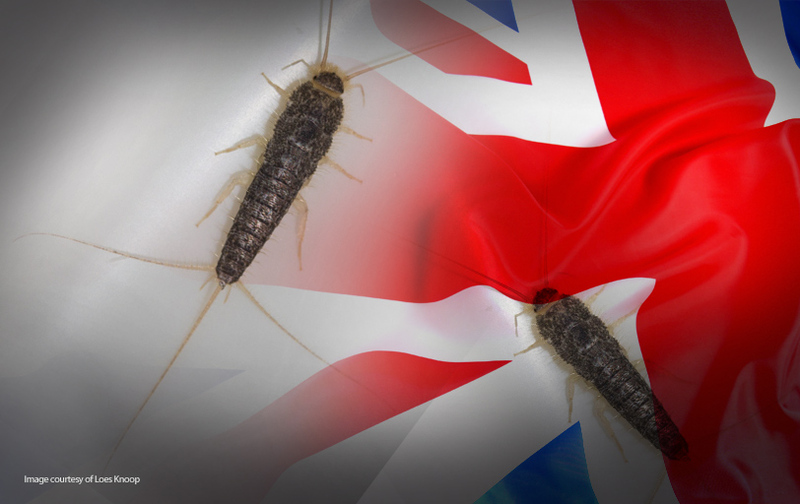 It is likely that grey silverfish activity in museums and similar environments is underreported throughout UK and Europe, due to its similar appearance to the common silverfish. Perhaps unfamiliarity with grey silverfish has a part to play, when those involved in Integrated Pest Management undertake initial identifications. Researchers Pascal Querner and Doris Hassler, from the Institute of Zoology, BOKU University in Vienna, have also reported on grey silverfish problems, this time in Austria. Their results would have surprised UK readers prior to this PCN article. In the UK, it is safe to say that until now, most of us would expect the typical silverfish, Lepisma saccharina to be the most numerous silverfish in properties, such as museums or even domestic premises. In fact, for many of us, this is the only silverfish we have heard of. Using adhesive insect monitors, Querner and Hassler monitored museums and storage depositories for the presence of silverfish and related species, such as the grey silverfish, firebrats and four-lined silverfish. They found that the grey silverfish Ctenolepisma longicaudata was in fact the most common in museums and were reported to be damaging contemporary art objects made of paper. Similar patterns are also emerging from Northern Europe in the Netherlands (Shoelitsz and Brooks, 2014; Knoop, 2016) and Germany, where C. longicaudata is called the ‘paperfish’. In this part of Europe it is also possible that pest control technicians and even some entomologists may have been misidentifying grey silverfish as silverfish (or even firebrats!) for many years, which may have been contributing to the rise of these pests. Check under a microscope for the presence of grouped setae (= hairs). With the kind permission of entomologist Darren Mann at OUMNH and museum pest consultant David Pinniger, PCN is able to reproduce the following identification table, which should help with the identification of the four synanthropic ‘silverfish’ in Europe. In summary, the implications for collections care (and beyond!) could be serious and research is needed to establish if the environmental requirements of this species are different and less demanding than L. saccharina. Error: Error validating access token: Session has expired on Sunday, 17-Feb-19 03:23:39 PST. The current time is Thursday, 18-Apr-19 21:48:03 PDT.